The abstract ‘Moderate walking speed predicts 3-years hospitalisation in hypertensive patients with cardiovascular disease’ will be presented during the Young investigator award session III – Exercise Basic & Translational Research (EBTR) which takes place on 20 April from 08:30 to 10:00 CEST in the room E3. Each patient was asked to gauge what they considered a moderate walking intensity using the Borg Scale of Perceived Exertion which ranks how hard you feel you are working from six to 20. Six is “no feeling of exertion” and 20 is “very, very hard”. Moderate activities are scored 11 to 14 and feel “fairly light” to “somewhat hard”. Best JR, Liu-Ambrose T, Metti AL, et al. 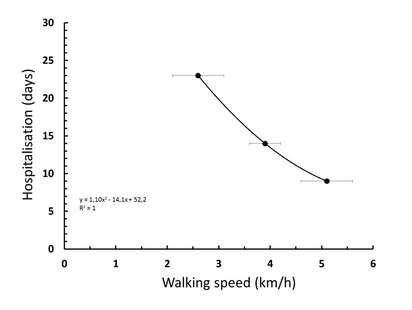 Longitudinal associations between walking speed and amount of self-reported time spent walking over a 9-year period in older women and men. J Gerontol A Bio Sci Med Sci, 2017. Jun 22. doi: 10.1093/gerona/glx129. Granacher U, Voller H. Gait speed is not magic, but is prognostically important in older patients. Eur J Prev Cardiol. 2018;25(2):209–211. doi: 10.1177/2047487317744053.